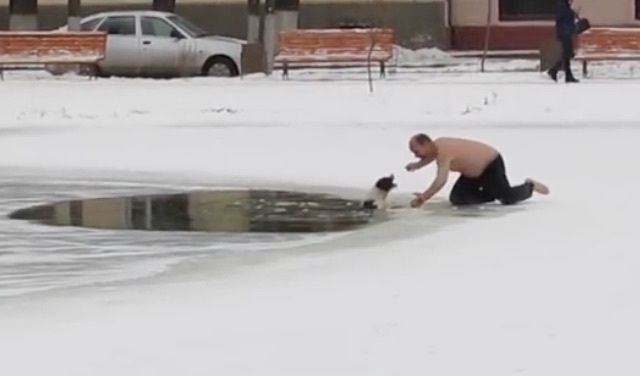 This anonymous Russian superhero risked his own life to pull a dog to safety from an icy pond – and he did it all without a shirt on. The man filming the incident, Alexander Levashov, had apparently turned on his camera after calling emergency crews on behalf of the dog when the unnamed rescuer charged towards the water. Unfortunately for the man, the terrified pup gave him a few bites on the hand, out of anxiety, though it didn’t deter the stranger in the slightest. Finally, he was able to get his hands on the scruff of the dog’s neck and yank him out of the water. The dog trots away to safety and the man – even though he’s injured – beams at the camera. Emergency services arrived shortly afterwards and treated the bite while the dog was rushed home.